Casseroles aren’t the same old boring, soggy, hot dishes they used to be. This recipe offers both appealing taste and texture. 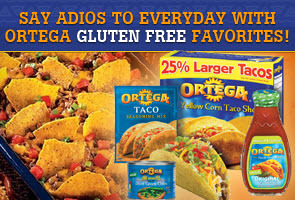 Ortega seasonings spice up the filling, and layers of taco shells give it crunch. COOK beef, onion and garlic until beef is browned; drain. Stir in water, taco sauce, chiles, 1/4 cup olives and seasoning mix. Cook over low heat for 3 to 4 minutes. 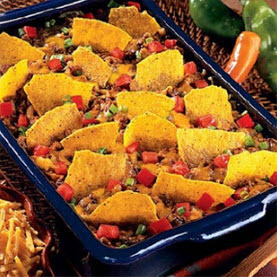 LAYER half of broken taco shells on bottom of greased 12 x 8-inch baking dish. Cover with half of meat sauce; sprinkle with 1 cup cheese. Repeat with remaining shells, meat sauce and cheese. Bake for 20 to 25 minutes or until bubbly and cheese is melted. Top with remaining olives, tomatoes and green onions.